"This coffee is delicious!" "Go-to favorite" "Fantastic and great value" "I am more than impressed" "Extremely satisfied with their body and flavor!" 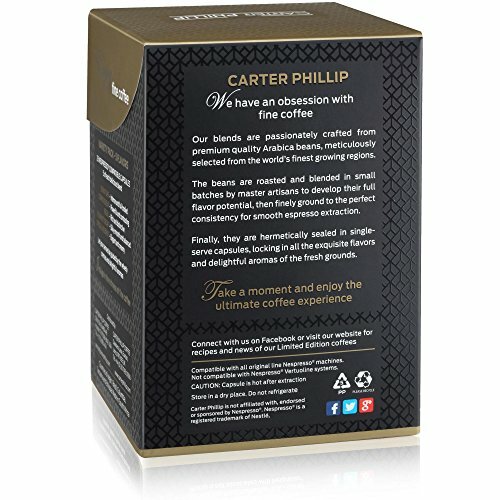 "Excellent Customer service" "Best Nespresso alternative I found"
ULTIMATE VALUE - Experience pure, premium coffee at an affordable price with Carter Phillip. We strive to always bring you the ultimate value for your hard-earned money. You risk absolutely nothing! All Carter Phillip products are backed by our unconditional 100% no-risk, no-nonsense money back guarantee. 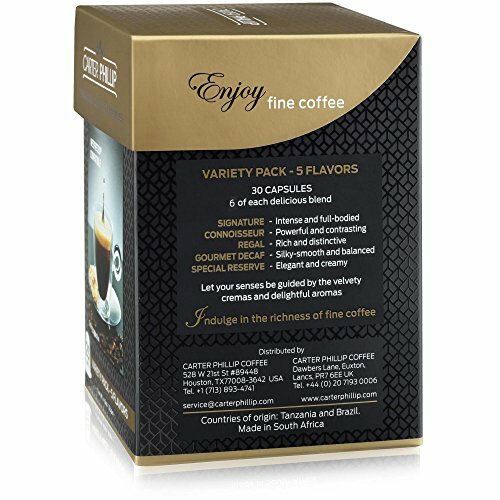 RICH, 5 FLAVOR VARIETY PACK - Contains 6 single-serve capsules of each of our delicious blends: Signature - Italian-style, full-bodied dark roast. | Connoisseur - Powerful and contrasting dark roast. | Regal - Rich, balanced dark roast. 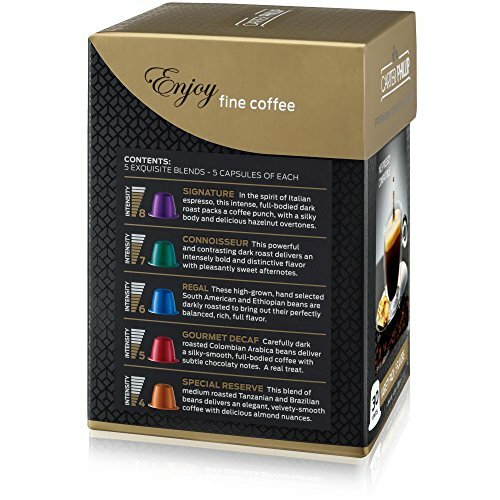 | Gourmet Decaf - Carefully dark roasted, indulgent decaf. | Special Reserve - Elegant, Velvety-smooth medium roast. 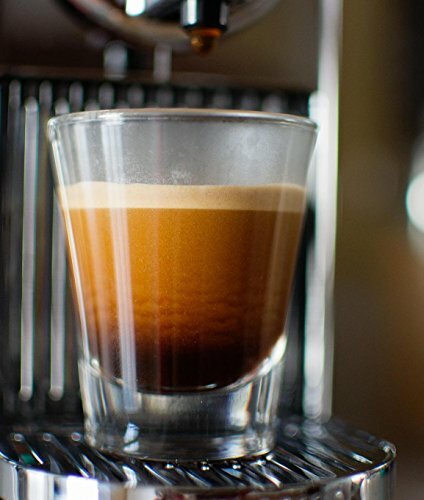 SEAMLESS COMPATIBILITY - Our espresso capsules are precisely designed, resulting in perfect compatibility with all Nespresso Original Line machines. These Include: Essenza, Pixie, Inissia, Citiz, U, Lattisima, Gran Maestria, Le Cube, Kitchenaid, Prodigio and Creatista. NOT COMPATIBLE WITH: Vertuoline, Evoluo, Dolce Gusto, Keurig or others. 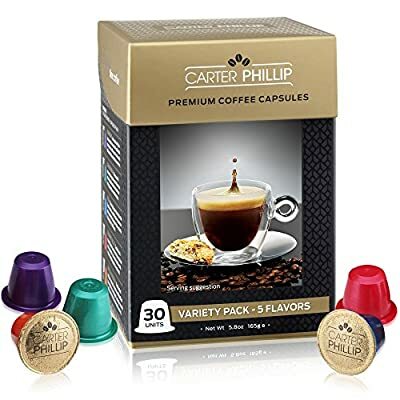 PREMIUM QUALITY - Carter Phillip Nespresso compatible pods are filled with the world's finest Arabica coffee; roasted, ground and blended to perfection to create a delicious assortment of lungo, decaf, dark roast and medium roast coffees. 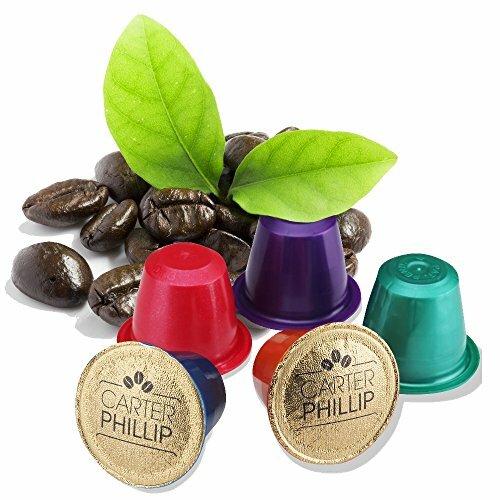 A FRESH APPROACH - Every Carter Phillip espresso capsule is produced using BPA-free materials in an FDA registered facility. They are also totally preservative free! With us, you can rest assured that you are getting naturally delicious coffee that is safe for the environment. 100% SATISFACTION GUARANTEE - At Carter Phillip, your satisfaction is our Number One Goal! We offer a full, no-nonsense, Customer Satisfaction Guarantee and pride ourselves on our top-notch customer service.